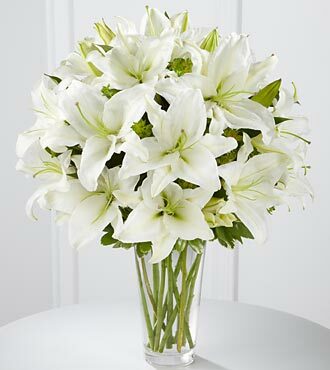 The Spirited Grace Lily Bouquet by FTD offers sweet serenity with every fragrant bloom. Bright white Oriental lilies create a simple, yet sophisticated bouquet, arranged in a sleek clear glass vase sending your wish for happiness and tranquility.Lilies may arrive in various stages of development. The lily blooms will continue to open, extending arrangement life - and your recipients enjoyment.